Rebelscum.com: Hasbro: Canadian Toys "R" Us Exclusive The Black Series 6-inch Zuckuss Now Online! 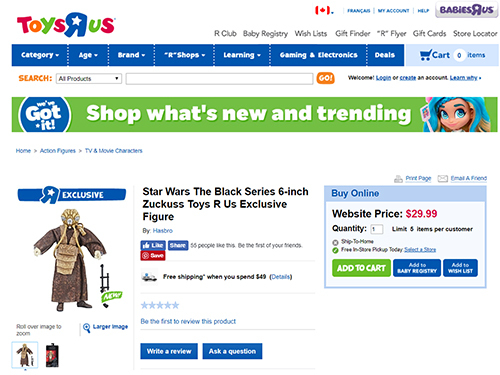 Hasbro: Canadian Toys "R" Us Exclusive The Black Series 6-inch Zuckuss Now Online! Hasbro's The Black Series Zuckuss 6-inch action figure is now available on ToysRUs.ca. "Ship to Home" is not currently an option, but free in-store pickup is available.